Toyota Starlet Anais Breaks Record For The 3/4 Class !!! 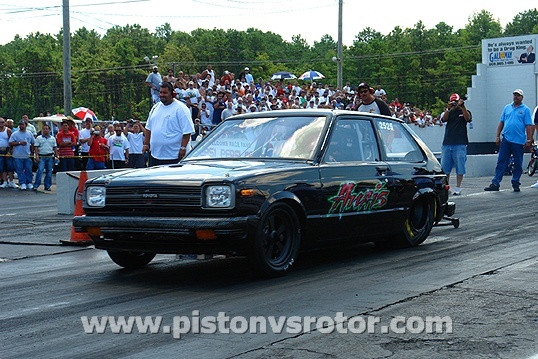 JUAN VAZQUEZ FROM PUERTO RICO , ON JANUARY 27 TOYOTA STARLET ANAIS UNDER THE HANDS OF SIGUEL RACING GAVE A SPECTACULAR 7.27seg PASS AT 183mph. CAN'T WAIT UNTIL SIGUEL COMES OUT WITH HIS OWN CAR THIS YEAR !!! BY THE WAY, EXPECT ALOT OF SURPRISES FROM SIGUEL RACING AND HIS CREW !!! DAmmit that was nice! I'll be at the track in may, when I go !!!! I hear you. I'm going next month and I'm going to Salinas, Carolina and Ponce fo sure! Chevere, voy a chequear la pagina para ver la fecha aver si tengo un break para ir. Quick Reply: Toyota Starlet Anais Breaks Record For The 3/4 Class !! !